Riverside Therapist: Rebecca Tekeian - Therapist 92507. Rebecca Tekeian, MA, is a Licensed Professional Clinical Counselor who has extensive experience working with children, families, individuals and couples, working through a vast range of issues. She received her Masters Degree in Clinical and Mental Health Counseling from the University of Redlands in 2015. Rebecca has also worked extensively with trauma-related issues, in addition to participated in intradisciplinary treatment for her clients, specifically for foster children and young children. Rebecca has served in the Southern California community while earning her Masters Degree and upon graduation. along with other issues. Rebecca has worked closely with couples regarding co-parenting and separation as well. Rebecca integrates an eclectic model, serving the need of each individual client, but including the following modalities: Cognitive-Behavior Therapy (CBT), Emotion-Focused Therapy (EFT), Solution-Focused Therapy and other techniques. Rebecca has cross-cultural experiences as well, focusing on integrating and adapting into a new culture as well as has provided services overseas. 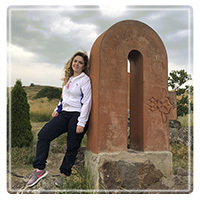 Rebecca has done extensive work with families, couples, individuals and children outside of the United States in the country of Armenia. She has spent time providing professional training in education and practice as well. Rebecca works with each client to meet their goals and to provide a positive therapeutic experience during each session. Feeling safe in the therapeutic setting is important to getting the client where they need to be. In the same sense, having a space that is peaceful, adaptable, approachable is always important as well. Having an online practice where you are able to be in your own home, or wherever you feel comfortable helps to reach that comfortable and safe space more readily. I am available mornings, evenings, and weekends as well. Working towards goals in a collaborative way is key to gaining the most potential from the counseling experience. The objective is for the client to attain the goals learned in the session to be able to apply it to their own daily lives, functioning at a better peak than before counseling. It is her goal to have a client have a deeper understanding of their issues and what should be done thereof. Rebecca looks forward to helping you along your journey, whatever that may look like. I currently charge $95 per 50 minute session done online via my website RT-COUNSELING.COM . Feel free to contact me through this website or through the information provided on my website.